Posted 9:39 am, Feb. 12, 2019. Outside the classroom, Rovelli’s passion lay in health and fitness. As a certified fitness instructor, she regularly taught group classes at the university’s campus recreation center. Merging her love of exercise and marketing, Rovelli initially wanted to launch her career in sports marketing. However, after completing an internship during her senior year, she decided that her passion for fitness didn’t translate into a full-time career she wanted to pursue. Instead, Rovelli began hunting for general marketing and brand management positions. But the deeper she went into her postgraduate job search, the more she realized that she needed an advanced degree to get the kind of job she really wanted. “That’s when I knew I wanted to take my marketing curriculum and go one step further with it,” Rovelli said. She began looking at Master of Marketing programs to fill in that education gap. 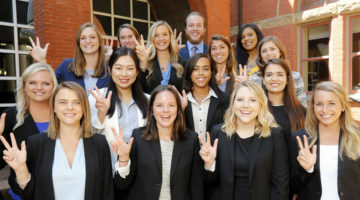 When Rovelli entered the Master of Marketing (MMark) program in the fall of 2017, she never expected to find a community of lifelong friends. Her class of 15 students became extremely close over the course of the school year. “All of us girls were like sisters by the end of it,” she said. 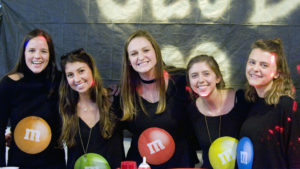 Whether they were watching the Bachelorette on Monday nights or attending Cyclebar classes that Rovelli taught at the Gulch, the Master of Marketing class developed an unbreakable bond. For example, in one of their marketing classes, the students were tasked with creating an advertisement for a fashion brand. Using Canva, an online graphic design platform, Rovelli and her classmates created a commercial featuring Emma Stone. 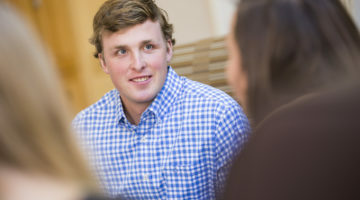 “All the MBAs’ jaws just dropped and they were like, ‘These kids are going to shake this up,’” Rovelli said. While Rovelli fell in love with Nashville and the south, she ultimately decided to look for full-time opportunities near her home in Connecticut. “I went to school in the south for five years… so it was kind of bittersweet leaving Nashville, but something always pulls (you) back to where you’re from,” she said. 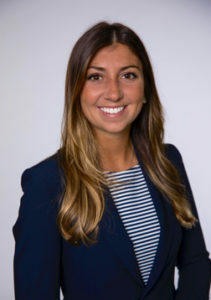 Armed with her Master of Marketing degree and networking connections, Rovelli ultimately landed a job in New York City, where she works as a Senior Analyst for Global Loyalty Partnerships at American Express. She partners with major brands like Sephora, The Cheesecake Factory, and Four Seasons Hotels and Resorts to develop gift card loyalty programs for American Express customers, who can redeem the points they earn from transactions for rewards like gift cards, flight miles, and hotel stays. “We definitely stay ahead of the game and think outside the box, which is pretty fun since it allows me to bring my creative energy and my marketing background (to my work),” she said. 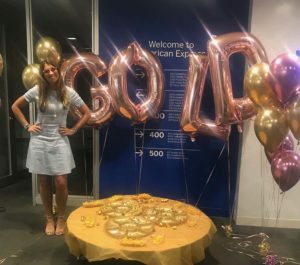 Having worked at American Express for several months, Rovelli has no doubt that the company is a great fit for her. 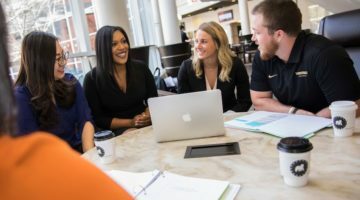 “I wanted that big corporate feel with a solid reputation and amazing marketing program, but I also wanted to be able to have my life and my flexibility and love the people that I’m working with,” she said. Rovelli especially enjoys the work-from-home Fridays, as well as the inspiration she gains from surrounding herself with a workforce that is over 50% women. Reflecting on her journey from North Carolina to Nashville to New York, Rovelli says she’s grateful for each step of the way and where she is now. 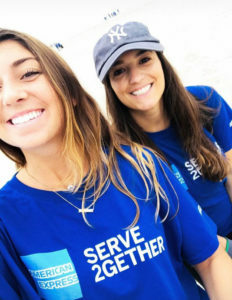 “(American Express) is big on lifting each other up and it’s a really positive environment to be around and to start out as my first job, so I got really lucky,” she said.